As I explored the reconstructed buildings at the Booker T. Washington National Monument, I came upon this scene. 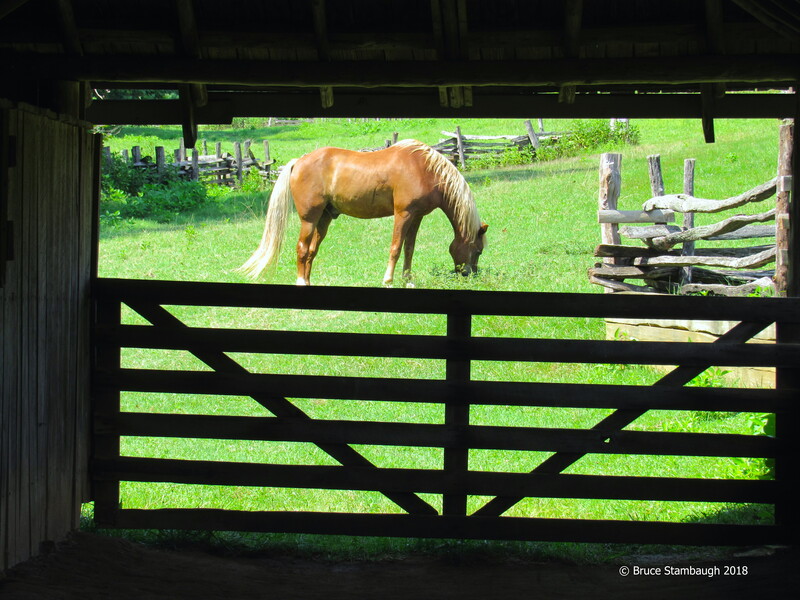 The grazing horse was on the north side of the barn, and I was on the south. For fear of spooking the horse, I used my long lens to zoom past the open barn door, the horse stalls, and to the shadowed gate on the far side. The contrast between the darkened gate and the sundrenched horse made an interesting composition. “Grazing in the Sun” is my Photo of the Week. It is a great use of framing. Love this photo!! Zooming in like you did left no distractions from what you wanted the photo to be about. Only great contrast between the horse and the green grass.